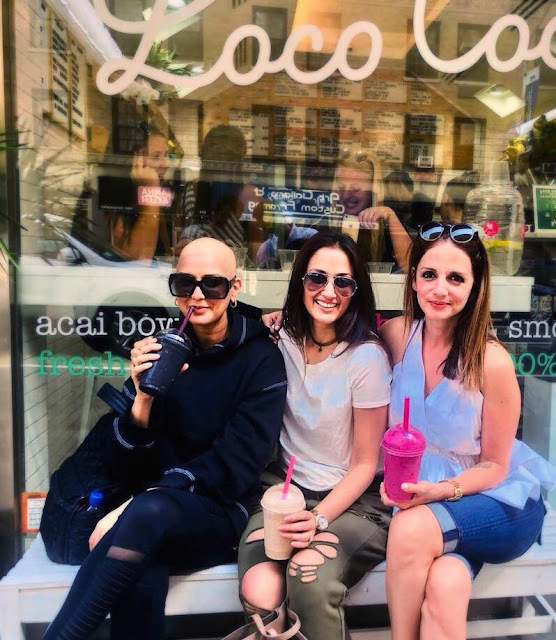 Sonali Bendre is currently undergoing treatment for metastatic cancer in New York and the Bollywood actress is fighting against cancer like a tigress. In her recent post, Sonali Bendre posted a picture where bald Sonali is seen sharing the frame with her friends Suzanne and Gayatri. Bollywood actor Hrithik Roshan, his ex-wife Suzanne Khan and Gayatri Oberoi are in New York to meet their dear friend Sonali. Sonali Bendre has posted “This is me. And in this moment, I am really happy. People give me strange looks when I say that now, but it’s true and I’ll tell you why. I am now paying attention to every moment, looking for every opportunity to find joy and #SwitchOnTheSunshine. Yes, there are moments of pain and low energy, but I am doing what I like, spending time with people I love, and feeling very loved and happy. I am extremely grateful to my friends, my pillars of strength, who at a moment’s notice, arrived to be with me and help me through this. In between their busy schedules they find time to visit, call, message, FaceTime… basically never leaving a moment for me to feel alone. Thank you for showing me what true friendship is. #HappyFriendshipDay, ladies. Blessed to have you all in my life.